INVENTORY UPDATE 2/15/19: Due to extreme flooding on our property we are literally under water! We will have no small hornworms this week but will have a limited number of 1-1/4" to 1-3/4" hornworms. 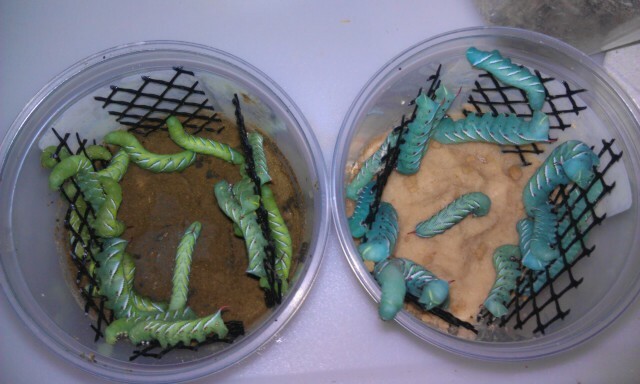 We hope to build our hornworm inventory back up quickly, but are still assessing the damage, which is extensive. Our apologies for the inconvenience while we work through this issue. All POSTPAID items ship via USPS. Postage is included in the prices shown. *Remember, if you don't find what you are looking for in our postpaid section be sure and shop on our non postpaid pages! NOTE: Postage paid products ship separately and cannot be combined with other items for purposes of calculating shipping. Any product ordered from any other page will pack/ship separately, and regular shipping charges will apply. 1 Hornworm Cup w/green food (original green worm) -- Price includes USPS Priority Mail shipping. 2 Hornworm Cups w/green food (original green worm) -- Price includes USPS Priority Mail shipping. 1 Hornworm Cup w/green food (original green worm) PLUS One Cup w/Mesh & Green Chow to continue to grow your hornworms -- Price includes USPS Priority Mail shipping. 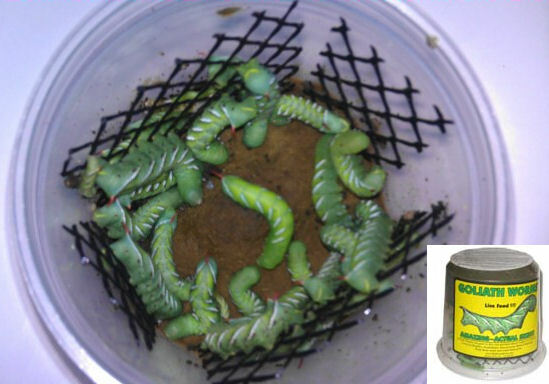 2 Hornworm Cups w/green food (original green worm) PLUS Two Cups w/Mesh & Chow to continue to grow your hornworms -- Price includes USPS Priority Mail shipping. 4 Cups (100 count ea.) "Small" (Approx. 3/8") Black Soldier Fly Larvae -- Price Includes USPS Priority Mail Shipping. 4 Cups (100 Count ea.) "Medium" (Approx. 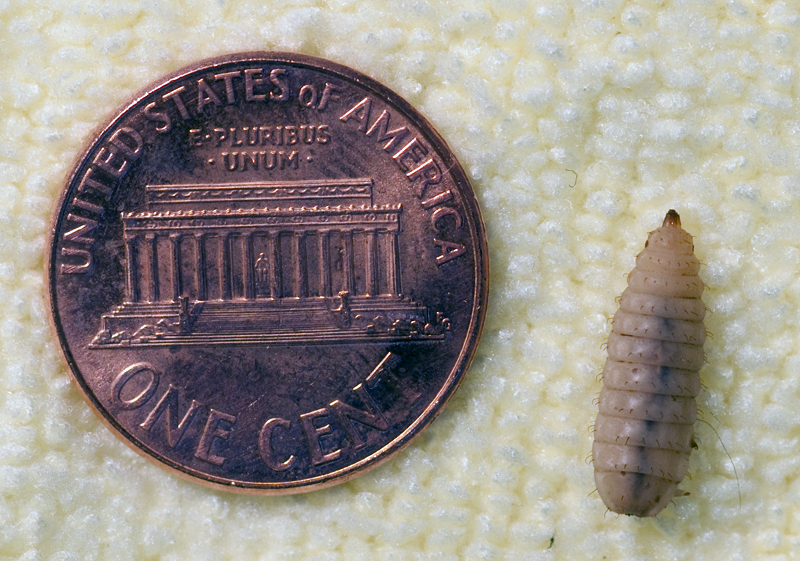 1/2") Black Soldier Fly Larvae -- Price Includes USPS Priority Mail Shipping. Cup of 500 "Small" (Approx. 3/8") Black Soldier Fly Larvae - Price Includes USPS Priority Mail Shipping. Cup of 500 "Medium" (Approx. 1/2") Black Soldier Fly Larvae - Price Includes USPS Priority Mail Shipping. PLEASE READ: IT HAS BEEN BROUGHT TO OUR ATTENTION IN THE PAST THAT A GLITCH IN THE CHECKOUT PROCESS CAUSED SHIPPING CHARGES TO BE APPLIED TO SOME POSTAGE PAID ORDERS. THIS PROBLEM HAS BEEN "FIXED" BUT WE ARE KEEPING THIS NOTICE HERE IN CASE IT HAPPENS AGAIN. IF YOU PLACE AN ORDER FOR POSTAGE PAID ITEMS ONLY, PLEASE EMAIL US AT ADMIN@MULBERRYFARMS.COM IF SHIPPING CHARGES ARE BEING ADDED (NOTE THAT IF YOU ADD NON POSTAGE PAID ITEM(S) TO AN ORDER CONTAINING POSTPAID ITEM(S) THE SITE WILL CHARGE POSTAGE FOR THE NON POSTPAID PORTION OF YOUR ORDER). THANK YOU. TO OUR CUSTOMERS WHO ARE HERE LOOKING FOR PHOENIX WORMS®, WE ARE NO LONGER CARRYING THAT PARTICULAR BRAND OF BLACK SOLDIER FLY LARVAE ("BSFL"). In order to offer you the highest most consistent quality, we are constantly monitoring supply and seeking sources that will offer quality BSFL to our customers who desire this small and nutritious feeder (compare our Black Soldier Fly Larvae to ReptiWorms™ and Phoenix Worms® - also black soldier fly larvae, sold under those brand names). As always your feedback is appreciated. Thank you.